Rice University, a highly ranked private research university with 3,900 undergraduates in Houston, announced this week that it would offer free tuition scholarships to undergraduates whose families earn $130,000 or less. Students with family incomes of $65,000 or less will receive free tuition plus grants covering the full cost of room, board and fees. The plan will take effect in the fall of 2019. In a statement, Rice president David Leebron said, “Talent deserves opportunity.” Rice has a long history of generous aid to students. It charged no tuition from 1912, when it opened its doors, until 1965. Tuition, room and board are now $61,350 for Rice students who receive no aid. Though steep, that price is lower than other highly ranked private schools, like the University of Chicago, which charges $75,800, and the University of Southern California, which charges $72,200. Rice is No. 28 on Forbes’ 2018 list of America’s top colleges. Chicago is ranked 18th and USC, 30th. Under Rice’s new plan, called The Rice Initiative, students with family incomes between $130,000 and $200,000 will receive scholarships covering at least half of their tuition. The new Rice grants are need-based. Families with large assets may not qualify. Rice already has a need-blind admissions policy for domestic students, pledging to admit applicants regardless of their ability to pay with the promise that it will meet 100% of their demonstrated need through grants, loans, and campus jobs. Nevertheless, two years ago it attracted scrutiny from federal lawmakers when it announced a tuition hike of $1,600. 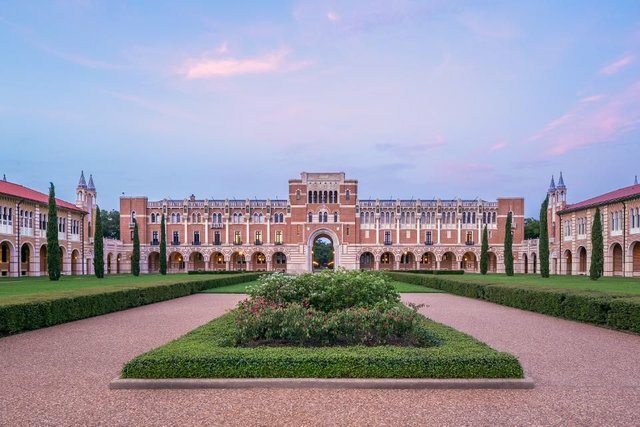 Rice has an unusually large endowment, worth $5.5 billion, and Leebron said in the announcement that strong investment returns helped make the new plan possible. The Rice tuition cut comes at a time when many colleges are slashing their sticker prices in response to enrollment declines and the widespread sense that the cost of higher education has risen too quickly. In the ten years ending in 2016, the full price American colleges charge for tuition and fees rose 63%, according to the U.S. Bureau of Labor Statistics. At the same time, according to the National Student Clearinghouse, which tracks college attendance, since enrollment peaked in 2011, 2.9 million fewer people are going to college. Among other institutions that have announced tuition cuts: Mills College, a women’s school with 1,300 undergraduates in Oakland, California, which dropped its tuition from $45,000 to $29,000, effective this fall. In August, The Hechinger Report ran a story about colleges that have recently announced tuition cuts. They include Drew University, Sweet Briar College, Birmingham-Southern College, Benedict College and the University of Sioux Falls. Some schools have announced they are reducing costs for specific groups of students. For example, Old Dominion University, a public school with 20,000 undergraduates in Norfolk, Virginia, is cutting its tuition price by 28% for active-duty members of the military. Earlier this month, Capital University, a Lutheran liberal arts school in Columbus, Ohio, announced it would offer half-price tuition to undergraduates whose families work for nonprofits or in other public service fields. College price drops can have an element of deception. Most students get some form of discount or financial aid, and even many affluent families can receive thousands of dollars in merit aid from schools that want to boost the enrollment of students with strong academic records. A helpful tool is the National Center for Education Statistics’ College Navigator site. A search for Rice shows an average net price in 2016-2017 of $24,000, which means the new cost cuts will make a real difference for many families.